Just Jingle: Skipping Stones Design Feature Friday!!!! *sigh* I love playing with texture sometimes! And here is the card in all it's shining glory! I also pulled out Sentiment Frames for my sentiment on this one. AND...some fabulous paper from Canvas Corp! The ribbon is May Arts and the twine is Stamp'n Up! Honestly, you guys... this was SUCH A fun card to make! I love the different textures in it and it makes me happy! YAY!!!! You wanna know what else makes me happy? Fridays. Fridays make me REALLY happy. Although, I really wanted a white hot chocolate from Dunks and apparently they replaced that (without my permission, mind you) with the mint one and that's just gross!!!! Grrrrrr!!!! But, alas, 'tis still Friday, so I choose to be happy anyway. My Yogi tea will get me through! HA! Have a happy day!!!! Oh...and don't forget to check out my other post for today...I made a Kokeshi Christmas card that is just cuteness!!!! First of all, lil' Jen, I need to say I HAVE read & admired ALL your wonderful posts & projects this entire past week! FORGIVE THE LACK OF COMMENTS! It's been one of those weeks (YOU know the ones) when, just as you think you are going to have some minutes to yourself, BAM! - something or someone needs your attention. FINALLY settling down around here ... ahhhhh! At any rate, I absolutely love each thing you made! I have to confess to being 'specially crazy about the antler piece! FUN!!!! Just. Like. YOU!!! Have a happy weekend, sweety-girl! I sooo love the texture you used. Fabulous design. 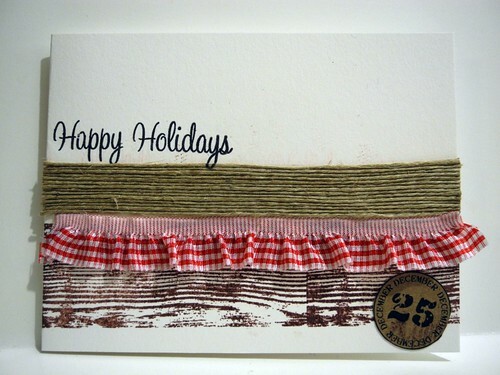 Really like all the elements you used on your holiday card - especially the woodgrain stamp! This card is really great! 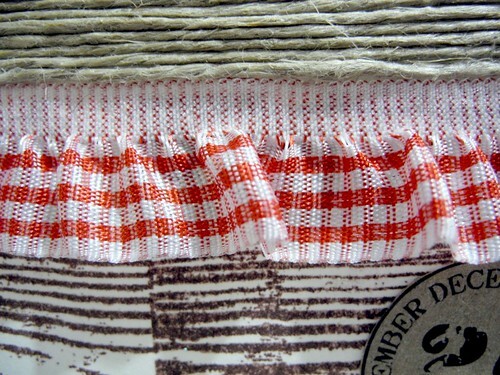 Love the different textures and that it's all neutrals except for the little pop of red from the ribbon. Thanks for sharing! The texture on this is downright amazing. Lovely mix. This is great~would never had thought to use all of that together:):):) wonderful post!!!! Jen, I love this card too! You did an amazing job. Super cool. Had to look and look again to really appreciate these colors and textures. Rock on! What a fabulous use of textures in this card! I love how it is so Christmas-y without any "traditional" images! I also went back and had a look through your past few posts and I am amazed at all I have seen! Jingle you are a genius!!! All of these textures along with the red and brown colors are amazing together! Absolutely love it! I looked at that card and just thought: OH WOW!